In February 2012, Bavarian authorities raided an apartment in Munich, wherein they found over 1,500 pieces of art stolen, or otherwise procured, by Hildebrand Gurlitt during World War II. Nearly two years passed before this discovery was disclosed by authorities and it was not until last week that a small portion of the haul was revealed to be on display at a top-secret location somewhere in Austria. For more than fifty years Gurlitt’s son, Cornelius, now in his eighties, hoarded the enormous collection and sold a piece or two at a time when in need of money. Whilst extensive investigation will be required to determine the provenance of these works, it is assumed that a great portion of them were seized from Jews across Europe by the Nazis. 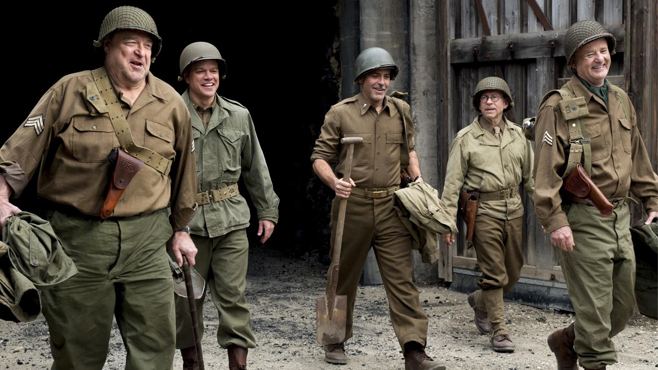 It is this practise which is the central idea of George Clooney’s latest effort as director – The Monuments Men. Having dealt with McCarthyism and the threat of communism in Good Night and Good Luck (2005) and political corruption in The Ides of March (2011), Mr. Clooney remains determined to make films with meaty subject matter. The seizure of art by the Nazis, predominently from Jews, during one of the darkest episodes in modern history would certainly appear to fit the bill but this film is more Ocean’s Fourteen than Schindler’s List. Clooney, who plays leader of the pack Frank Stokes, enlists the help of fellow painters, museum curators, architects and art historians from across the US of A and Europe to track down and recover art stolen by the Nazis, destined for Hitler’s ‘Fuhrer Museum’, as they made their retreat into Germany in the latter stages of the war. Sobering images of the annihalation of Monte Cassino in 1943 and the theft of the Ghent altarpiece from Catholic priests mean that the film starts on an understandably somber note. However, the death and destruction of the opening minutes is swiftly replaced by the amusement of Stokes collecting his team for the job, Danny Ocean-style. He starts of course with Matt Damon (James Granger – curator of the Met museum); then funnymen John Goodman (businessman? Walter Garfield) and Bill Murray (architect Richard Campbell); Bon Balaban as the diminuitive Preston Savitz (art historian); Hugh Bonneville as token Englishman and recovering alcoholic Donald Jeffries; Jean Dujardin as token Frenchmen Jean-Claude Clermont and there is room for one woman – the résistante Claire Simone, played by Cate Blanchette, who works at the Jeu de Paume museum in Paris where many paintings are held and catalogued before being taken to Germany. The band of merry men assemble in the south of England for a ‘basic-training’ montage and it’s all jolly good fun. The contrast of this light-heartedness with the seriousness of the subject matter and, excuse the pun, the bigger picture of events of the time mean that it is uncertain whether we should take this film as an inciteful wartime piece or an ensemble romp set to the backdrop of Nazism. There are a few genuinely funny moments – Granger (Damon) claims to speak fluent French but is repeatedly told by French people to speak English as his français is so poor, having studied it in Montreal – this received a tongue-in-cheek laugh from the Ontarians I watched the film with. Murray and Balaban achieve an amusing bickering-old-married-couple partnership and the fishes out of water/combat inexperience of all of them is amusing up to a point. At the same time, Clooney remembers to include enough “this is why what we are doing is important” speeches to keep things from becoming farcical and as the group is scattered across France, Belgium and Germany in search of lost relics they do find themselves in a spot of bother here and there but it is all too disjointed and contrived for us to really involve ourselves with the characters and the material. The discovery of a hoard of golden teeth towards the end of the film strikes as rather fake and doesn’t have the impact that it should amongst all the tomfoolery and silliness. None of the actors really step out of their comfort zone – Bill Murray is great as Bill Murray in army uniform but he should have been Richard Campbell – and the same can be said for most of the cast, sadly. Only relative unknown Dimitri Leonidas (who plays German Jew and American immigrant Sam Epstein) does anything particularly meaningful; his personal quest to find a Rembrandt self-portrait owned by his grandfather before he was deported to Dachau is the most character development we receive. As the Americans are pulling out, fearful of the imminent arrival of the Russians seeking the artwork as the beginnings of reparations against Germany, we do will the Stokes gang to succeed but as the credits roll at the end of the film and black and white library images from the 1940s are shown onscreen I couldn’t help but think that Clooney hadn’t quite done justice to the men who had risked their lives for the sake of culture and humanity. At the end of the film Stokes is asked by President Roosevelt whether art is worth dying for and the film certainly wants to say so – I just don’t know whether it proves so. Posted in 2014 and tagged Bill Murray, Bob Balaban, Cate Blanchette, George Clooney, Hugh Bonneville, Jean Dujardin., John Goodman, Matt Damon. Bookmark the permalink.